When St. Andrew, one of the twelve Apostles, was being crucified by the Romans, he is said to have asked to be placed on a cross with a different shape from that of Jesus. His relics (bones) were said to have been brought to Scotland after St. Regulus had a vision telling him to take them to a far-off land. He landed at a place then called Muckros, later called Kilrymont and, later still, renamed St. Andrews. According to legend, before a battle between a combined army of Picts and Scots and the Anglo-Saxon King of Northumbria at Athelstaneford, a formation of white clouds in the form of the cross of St. Andrew appeared in the blue sky. The Northumbrians were defeated and St. Andrew became the patron saint of Scotland. The white cross on a blue background later became the Scottish national flag. 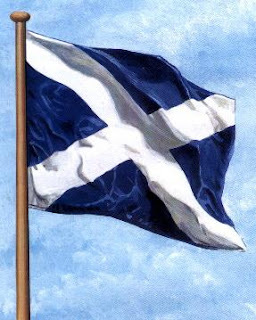 It is also known as the St. Andrews Cross or the Saltire Cross although the term Saltire actually refers just to the cross rather than the whole flag. In the 14th century many Scottish foot soldiers had a white cross on their tunics but it was not until the 15th century that the national flag came into widespread use. While the origins may not be completely known, the Scottish flag is regarded as one of the oldest country flags still in existence.